Nowadays just Scrabble really (and that's only to keep my word power going) - and playing Hungry Hippos & Buckaroo with the kids. I have one called Blackbeard's Treasure, basically a massive game where one side has a fort and the other a ship with some islands. It's really complicated with cannons that you have to use to try and shoot down the opponent's pirates, blow their fort up etc. Takes bloody ages to set up too since lots of things have elastic bands on them to make them 'explode' when hit by cannon fire. Really fun to play but the cannon balls get lost very easily as you can imagine! Search for Weapons & Warriors: Pirate Battle and you'll get more hits, since it was rebranded in the UK as Blackbeard's Treasure. Antiriad2097 wrote: Search for Weapons & Warriors: Pirate Battle and you'll get more hits, since it was rebranded in the UK as Blackbeard's Treasure. I've still got a stack of boardgames from the '80s in the spareroom... just never got rid of them for some reason. Anyway, here's a couple of favourites I played a lot back in the day. Haha Crossbows and Catapults and Lost Valley of the Dinosaurs were the two that immediately came to mind when I saw the thread title. Had the C&C Grand Battle set pictured there. Really appealed to the destructive side in most kids I think. Always wanted the other sets as a nipper. There was one with a giant Cyclops & Minotaur that flung the little shield/puck things, and Trojan Horse one too. Used to cut the images out of the Argos Catalogues and stick them on the wall beside my bed with other pics of stuff I wanted for Chrimbo. Such a satisfying and exciting game to play though. Plastic blocks and figurines flying everywhere. Some of those C&C images look kinda fancy - Was it re-launched recently? Always loved the games that came with lots and lots of bits and bobs. Space Crusade & Hero Quest are two more that I loved - Both were based on Games Workshop lines that were licensed to MB. Good move on GW's part - Got me into Painting Citadel miniatures, WH40K and Warhammer FB and GW stuff in general. I found a toy store while on holiday as a kid that was selling of the HQ expansion sets for 99p and ended up with 3-4 of each of them (the Skeleton one, The orc one and the Ogre one) so Had an over abundance of miniatures and extra tiles, so ended up customising the game with friends, making new weapon and spell cards and stuff. Made the thing loads of fun. Did anyone every actually play Mouse Trap? I don't think I ever did. just used to set up the Rube Goldberg thing and set it off. Ghost Castle! There is another one that was fantastic fun. I think everyone I ever knew who owned it lost the glow in the dark skull at some stage and had to resort to using a marble. Board games were a massive part of being a kid for me, always ended up playing them in friends houses when it was bucketing down outside. Back in the days when the computer was something that was packed away when it was not in use. There was always a cupboard in most people I knew's house stuffed with them. Video games have definitely killed them off a good deal in this modern age. I got given the Phantom Menace Monopolpy for Xmas 1999. Since I didn't like the film much, I never got round to playing this version. In fact it is still sealed. ootini wrote: Board games were a massive part of being a kid for me, always ended up playing them in friends houses when it was bucketing down outside. Back in the days when the computer was something that was packed away when it was not in use. There was always a cupboard in most people I knew's house stuffed with them. Video games have definitely killed them off a good deal in this modern age. When I moved into my place, I intended on having a board game cupboard - turns out my books/consoles/games etc took up all the space I'd need for one of those! Still got a "board game under-the-bed", mind. They are just not the type of thing that springs to mind these days when I find myself at a loose end. With all the consoles, DVD's and iPhones etc making for quick reach distractions and all that they're not even considered anymore. Maybe I'm just older and my spare time is at a premium and all that. But 20 or more years ago they were the go-to thing to pass a bit of time, especially on one of those days where the weather was to crappy to go outside. Now that you mention it I don't have a single thing in my place, bar Jenga. I doubt many of the ones I had as a kid escaped the parents massive clear outs every time a sibling left home. I THINK and HOPE that at least Hero Quest and Space crusade are still there in the attic in the folks. Although the Space Crusade was butchered for bits once I got into the 40K stuff. Jenga's good enough to keep hold of, doubles as building blocks. The only ones I still own that are the "originals" (as in, had them since youth) are Key To The Kingdom, Gum Guys and Connect 4. The rest've had to be "re-acquired" - which is easy enough in these technologically distractive times! Another vote here for Crossbows and Catapults, and Hero Quest. Some memories in this thread, although i had that frankenstein game and though it was rubbish! 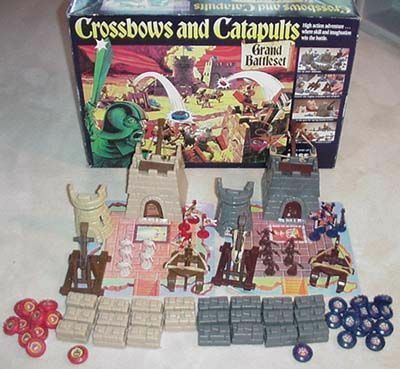 greenberet79 wrote: Another vote here for Crossbows and Catapults, and Hero Quest. Another two that I used to pour over in the Argos catalogues of yesteryear. Managed to get Tank Command at a school market for 50p. Unfortunately only had a few of the tanks, the box and little else. Another one I just recalled was an old Star Wars one based on Sarlacc pit bit from ROTJ. There was a column of Gammorean guards lining sides of a bridge which you had to knock off into the pit below. Only ever played it once and remember thinking it was awesome.